Butler Community College’s Life Enrichment will host Leon Leachman at 9 a.m. and Rachel Roth at 10 a.m. on Tuesday, February 5. Leon Leachman, of El Dorado, will present the final installment of his talk about the history of Israel as well as what is going on in Israel today. He will share his own photos of the country and its people. Rachel Roth, from the Great Plains Nature Center, will present “Birds are Liars, and Girls Sing Too.” We’ve all heard the dawn chorus of birds, but have you wondered what they’re saying? Spring into the world of bird songs and learn why those chirps, cheeps and caws are more complex than you might think. 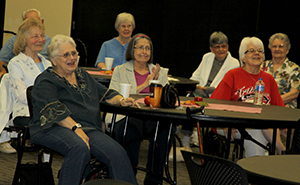 Life Enrichment meets on the first Tuesday morning of the month during the school year. Area adults enjoy high-quality speakers and performers, along with a light breakfast and coffee at each regular meeting. Meetings take place in the Clifford/Stone Community Room at the Hubbard Welcome Center on the El Dorado campus. Meetings are open to everyone and there is no charge to attend. Those who attend regularly are encouraged to register so they receive monthly newsletters announcing the programs. New members are always welcome. For more information about Life Enrichment or the Feb. 5 program, please contact Trisha Walls at 316-218-6355 or twalls@butlercc.edu.